Despite having a 3-0 lead in the first quarter against Colgate University, the Boston University men’s lacrosse team struggled to gain possession throughout the remainder of the game and ultimately fell 16-9 at Nickerson Field Saturday afternoon. Senior faceoff specialist Collin Orr went 20-for-28 at the faceoff X for the Raiders (4-3, 1-2 Patriot League), including 15-for-17 in the second half, which hindered the Terriers’ (4-3, 0-2 Patriot League) offense from gaining traction. Polley also noted the strain this put on the Terriers’ defense. BU shut out Colgate 3-0 in the first quarter after goals from freshman attack Chris Gray, sophomore midfielder John MacLean and senior attack Jack Wilson. Gray remained key for the Terriers’ offense and finished the afternoon with three goals and two assists — his third five-point performance of the 2018 season. The second quarter played out much differently as the Patriot League’s leading offense came to life with the Raiders netting six goals against BU sophomore goalkeeper Joe McSorley, who made eight saves on the day. Sophomore midfielder Griffin Brown — who notched five goals over the contest — began the onslaught, which was interrupted by a goal from Gray. However, Colgate then followed up with a six-goal run that spanned into the third quarter. The Terriers were out-battled on the ground ball front 10-4 over the quarter and went into the half down 6-4. The Raiders continued their offensive run in the third quarter and led by as many as five goals with 49 seconds remaining in the frame. After Colgate’s 10th goal from freshman attack James Caddigan Jr., McSorley went down trying to save the ball and was helped off the field. Senior goalkeeper Colin MacDougall took his place, but wasn’t tested as MacLean found Gray through traffic and passed the ball to junior attack James Burr who beat junior goalkeeper Connor Mullen. This marker cut BU’s deficit to four with three seconds left in the quarter. McSorley returned between the pipes for the Terriers at the start of the final quarter as the Raiders scored three times to open final 15 minutes, extending their lead to 13-6. 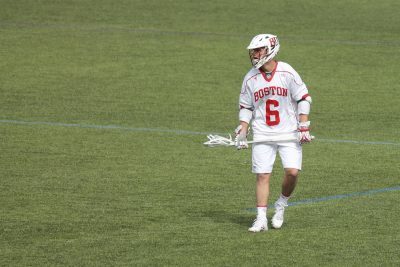 Things started to pick up for BU as junior attack and midfielder Brendan Homire found the back of the net after the Terriers gained possession from a successful cleared. Burr scored 69 seconds later with a backhanded shot over Mullen’s shoulder. Brown scored a clean shot in front of BU’s net, but senior midfielder Hayden Ruiz scored once again for the Terriers with 3:06 remaining in regulation to bring his team within five goals once again. Polley attributed this short offensive spurt to the offense playing with more urgency. Colgate finished the game with an empty netter and a shot that bounced in the goal, handing BU its second conference loss of the season.